A few days before my twins were born. My water broke at 33 weeks and 4 days and I had them naturally, 5 minutes apart! 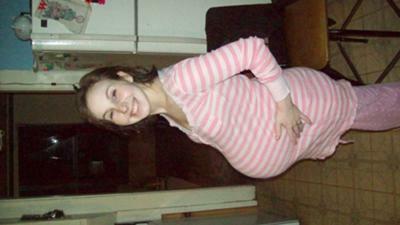 I am currently 33 weeks pregnant with twin girls. I get the comments almost everyday about how I do not look big enough to be having twins. I get offended every time someone makes such remarks. I also have a smaller frame but I am 5'8". My babies are in great condition and are a perfect weight. At my last ultrasound at 30 weeks they each weighed about 3 1/2 lbs. and were 17 inches. I know they still have room because the girls move like crazy. People need to be a little more considerate on what they say, especially to a pregnant woman. What a rude and bold statement made to use women who arent obese, and/or lacking abdominal muscle tone. I am furious with such comments, as if people imply we starve our babies or something. I started at 104(weight I have always been without being a health nut. I am a couch potato and I eat like a man.) I am now 174lbs with twins each weighing 4.6 and 4.8 at 32 weeks, and I am 5'5" and still get this crap. like really 174lbs?? and I dont look that big?? its all belly and combine the weight its almost nine bounds of baby. people are so dumb. I mean you really think a uterus is going to house two 8 lb babies at 32 weeks?? what do people expect. A uterus stretches only so far, abdominal muscle will hold you in if they are strong, and not to mention a long torso will house a baby up and down making it apear compact. my boys have been head up and the other head down the entire time so its maddening when people make such assumptions and cause a mother to question her ability to carry a child. uggggh! I had to rant! You look so small to have been pregnant with twins. How much did the babies weigh? Congrats on your babies! Im 33 weeks pregnant with twins now...How much did each of your baby weight? By the way congrats!